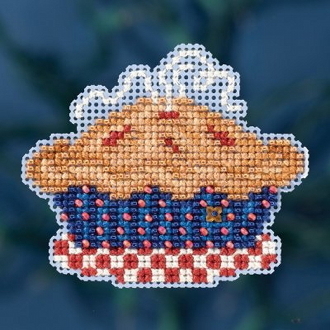 A lovely Patriotic Ornament design to cross stitch featuring an American Pie. Adorn with the enclosed Mill Hill Flower treasure. Makes one ornament to hang or use the enclosed magnet to decorate any metal surface! Finished size: 2.75"w x 2.5"h (7cm x 6.4cm). Mill Hill Glass Beads, Mill Hill Perforated Paper, floss, treasure, needles, magnet and chart with instructions.